Chances are if you or one of your children isn't a lover of all things LEGO, then you at least know a youngster or adult that is passionate about building with these familiar plastic interlocking bricks now found in more than 75% of homes in the Western World. I know our household is included in those statistics because my kids played with LEGOs as toddlers and as teens now, they still love them. With such popularity among all age groups -- whether serious or just for fun -- I'm surprised that it took this look to introduce a book as good as The Cult of Lego a collaboration between authors John Baichtal (Make Magazine Contributor and Wired's GeekDad Blog) and Jose Meno (Founder of Brick Journal, a LEGO fan magazine). After my whole family -- mom, dad, and four kids -- took a look at the sensational illustrations, photos and the text inside that awaits you, we all agree that it certainly was worth the wait for this particular book. Equal parts coffee table art book, history lesson, and creative inspiration for builders of all ages, this is a comprehensive title that is the first to capture all the excitement about LEGO into a single book. It has as equal appeal to the serious adult LEGO professional or hobbyist as it does to kids in a variety of age groups with various abilities. In hard cover with over 304 interlocking pages readers will learn about the fascinating 50+ year history of LEGO and how the product was first brought to market and how it has evolved over time up until the company's present foray into technology. This piece of non-fiction also delves into the intriguing world of men and women that fell back in love with the product as adults. Known as AFOLs (Adult Fans of LEGO) these are the enthusiastic bunch who build fantastical sculptures, attending conventions and competitions to congregate with like-minded souls. In fact, this A to Z book covers just about everything related imaginable from the Minifig Mania craze, LEGO Art, and the use of LEGOs as autism therapy and bricks used in marketing, to what goes on at LEGO users groups and conventions, and even a Guinness Book of World Records-type section where you'll learn about cool stats such as the biggest LEGO statue ever created -- the Sitting Bull sculpture at LEGOLAND Billund, Denmark that was built with 1.5 million bricks. The Cult of LEGO, Hardback $39.95 and eBook $31.95, is published by No Starch Press and is widely available in-store and online where books are sold. Note: As the dustcover indicates, this unofficial book is not endorsed or authorized by the LEGO Group. 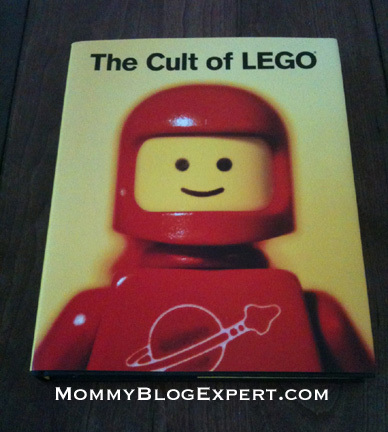 To WIN a copy of The Cult of Lego for yourself or to give as a gift to someone you know, scroll down for details about MommyBlogExpert's giveaway of this title. Just leave a comment(s) below this post, Contest ends January 17, 2012 at 12 midnite PST and is open to legal residents of the U.S. only. Winner will be selected at random from all entries and will be notified via email. FTC Disclosure: The publisher provided the book to me to facilitate this review and also is providing the prize for this giveaway. 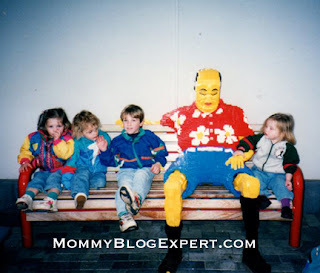 MommyBlogExpert did not receive any payment or other compensation associated with this post. See complete FTC Disclosure information that appears at the bottom of MommyBlogExpert's main page and at the bottom of every individual post on this blog, including this one. What a awesome book, my grandson loves Lego's, he would love this book. I would love this book - we grew up with Legos and now we are passing them on to our kids. I'd like to win this for my son-in-law because he is a Lego nut. Thanks for the giveaway! I did this: Follow MBE on Twitter (BBNeedsShews). I did this: Like MBE on Facebook. I did this: Subscribe to MommyBlogExpert. I did this: Follow WiredGeekDad on Twitter (BBNeedsShews). I did this: Follow John Baichtal on Twitter (BBNeedsShews). Very neat, would like to win this. My son lives for lego. Spends hours designing new ships etc. Read lego club monthly and he turns 8 next week! i would love to win this and give it to my adult daughter as a gift. she adored legos as a child and would love this book. I would like this book because I love the lego video games, and I am obsessed with lego culture. The kids are def. cultish about their legos so I'd love to read it. I want to win because my son is a lego fanatic! I want to win to give this to my husband because he is a huge LEGO fan. love win this prize LEGO !!!!!!!!!!! I want to win this awesome book because I have an empty coffee table that is just begging for some good reads. This book would be the perfect addition so I could enjoy it as well as guests who stop by for a visit. I grew up with alot of legos and now my son is a big lego fanatic. This looks pretty cool. My son is a LEGO addict and this would be so fun and interesting to have! My husband and I grew up with Legos and would love this book! My husband is a Lego fanatic, so I would love to win this for him. My coworkers are HUGE LEGO fans. We have lego gear all around the office... I'm pretty sure this would make me their hero. I would love to win this for my son because he is a huge Lego freak and I know he would just adore it. We love Legos so much, we took a weekend trip to hit a couple of different Lego stores. The whole family loves Legos. I dont know who would love this more my son or my husband either way its gonna be a hit in this house! My grandson loves Legos. I usually sit with him and try to help (actually I watch and keep him company because I can't do Legos at all but I pretend I know what I'm talking about). What a great book! I've enjoyed LEGOs since I was a kid and now my son loves them. I think this book looks interesting and that my whole family would enjoy it! I'd like to win because I loved Legos as a child and my daughter loves them now. I want to win this because I love Legos! Oh, my 3 boys do too! I would adore this book! My daughter is just starting to get involved with Legos (the little ones not the huge ones) so this book would be awesome! This would be perfect for my son who absoulutely loves legos. I want to win because I love legos. Thanks for the giveaway. My son Gabe is, literally, a LEGO fanatic! That is the first thing he asks for when asked what he wants as a gift. It's the first and last thing he plays with during the day. I can't tell you how many times over the years he has come to me with some new creation! He is 11 now and still is fascinated with Legos and I know he would love this book. Thanks! Our family loves the LEGOs! I want to winthis because Ihave always been fascinated with legos! I want to win because my sons would love this book. Thank you for the chance. I would love it for the kinder. Obsessed is a word to apply there. I would love to win as I'm a big fan of Legos! I want to win because my son has been collecting Lego since he was little and would love this book. CONGRATS to @Winsome6 WINNER of MBE's The Cult of LEGO Book GIVEAWAY!